There tends to be a large disconnect in the US between where you buy your food and where it comes from. As an American, when I wake up to make breakfast I walk from my bedroom to my kitchen that is furnished with the standard cheap-apartment appliances: a fridge, stove, oven, microwave, and more electrical appliances than I even know how to properly operate. I open the fridge, grab a gallon of milk, a carton of eggs, some veggies from the crisper, and a bag of shredded cheese. I bought all these things over a week ago, because that is how grocery shopping is done in the United States. Once a week (or maybe every two weeks if you love Costco) you load up your car with sale items and staples to cart them home to your refrigerator and pantry. Once you are stocked up, there is no need to return to the grocery store - in fact, you may even dread the thought of having to run to the store to grab just a single item you are out of. Now imagine going to the store twice a day. Once before lunch, and again to get supplies before dinner. Except it's not a supermarket like in the US, but one of many fresh markets within a 5 minute walk of your front door. There is no need for a car to lug your food back home, and no need for a refrigerator to store it in once it is there, because you only bought just what is needed for that meal. This is the lifestyle that Vietnamese people know and embrace. There is hardly any food or energy waste, and they only take what they need for that day. What are the benefits of the Vietnamese lifestyle? 1. Energy consumption is greatly reduced. Food travels on average 1,500 miles from farm to door. This means 1,500 miles worth of gasoline and CO2 emissions, as well as refrigeration to preserve the goods as they travel the length of the country. In Hanoi, 45% of the city's consumed rice is grown in the agricultural land surrounding the city. The wholesale market within the city is restocked in the earliest hours of the morning with food from the surrounding land to distribute to the smaller-scaled markets fresh daily. Due to the absolutely insane traffic congestion caused by the 6.5 million people in Hanoi as well as the high temperatures during the day, the wholesale market can only operate in the earliest hours of the morning. Just after midnight, farmers from the surrounding agricultural land wake up and load their trucks full of fresh produce to take into Hanoi. Hundreds of trucks arrive around 3am on the otherwise deserted streets to deliver the next day's meals. 2. Food waste is reduced. Since many of the products sold at markets are grown in the surrounding agricultural areas of Hanoi, there is less spoiling of produce as is travels from farm to market. The Vietnamese lifestyle embraces shopping twice a day. Once before lunch, and again before dinner. Vietnamese people buy just what they need and rarely have any excess to discard. A combination of shopping twice a day and the general lack of household refrigerators helps reduce the amount of food consumed at the market each day as well as the inevitable spoiled food that went forgotten in the refrigerator from last week. This reduction of food waste is especially important in Vietnam, as their waste management system is currently unsatisfactory and cannot handle an increase in solid or agricultural waste. What are the tradeoffs associated with the Vietnamese lifestyle? 1. There's no organic department within the street markets. The food sold in these markets is replaced every few hours from the surrounding agricultural land that is sprayed heavily with pesticides to keep up the necessary production for the urban population. Organic farming is a relatively new practice in Vietnam and produces very small proportion of the food consumed in Vietnam. We met with an organic farmer in Hanoi who is one of the first in the area. He told us there is demand for organic produce- many people in Vietnam are aware and weary of the heavy use of pesticides on agricultural products. However, there are few organic farms and the prices are not currently comparable to the rates you would find at the smaller street markets. This is not to say this problem doesn't exist in the US, but since we tend to shop at Supermarkets, there are often devoted sections of the store with organic produce readily available. 2. Sanitation isn't their strong point. Should you ever find yourself in Vietnam, I suggest trying "street food." There are small venders set up on the sidewalks or in small shops that prepare authentic Vietnamese dishes at an extremely low cost. However, coming from a Western diet, you are likely to get sick from this food if you are not careful. Typically the water there has not been purified, so you should avoid beverages with ice in them. I personally avoided meat, since there is no refrigeration for these shops. Instead they usually take a fan and wave the flies away from the raw meat waiting to be cooked. By adhering to these two rules, I managed to avoid getting sick while in Vietnam. What will I borrow from their lifestyle? I really love the idea of getting fresh ingredients everyday, and only what I need. Since I am someone who eats relatively small portions and avoid meat most days, the idea of a fresh market within a 5 minute walk of me at all times is fantastic. If you are out walking around ANYWHERE in the city and are craving fresh fruit, don't worry. Within a block of you there will be a fresh fruit stand with 20 different fruits, all fresh and within season. I hope to move to a larger city that can even begin to compare to this access to fresh food. Unfortunately in the US, its the larger cities that tend to be food deserts. I also enjoyed the sense of community found within the Old Quarter of Hanoi. 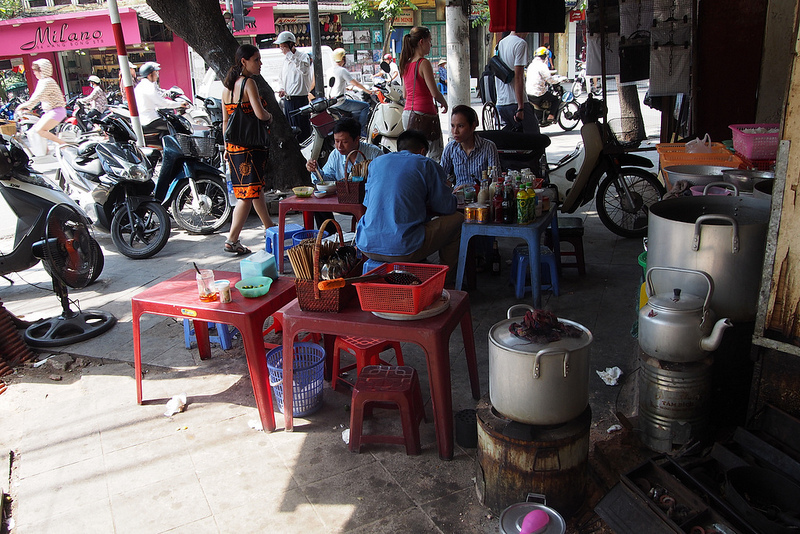 Tiny stools and tables are placed on the sidewalk in front of the street food venders. People would gather there to enjoy their meal or have a few beers with friends. The younger generation tends to hang out on these tiny sidewalk stools at night with friends drinking tea, beer, or my personal favorite: bia hoi. Be warned though, your chair cannot be in the street and there is a strict midnight curfew. How has this influenced my design work? This exposure to Vietnamese food production and food culture helped to inform my team's Vertical Cities Asia 2013 design project under the theme "Everyone Harvests." We focused on increasing the proximity of food production to the consumer as well as increasing the harvest from agriculturally productive land. See the project here.